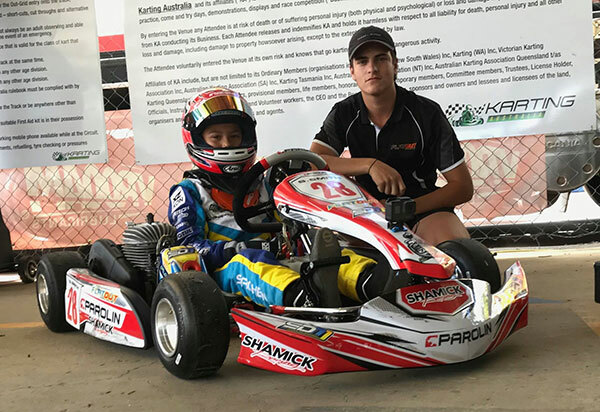 Western Australia’s Flat Out karts traveled across the country to compete in the second round of the Australian Kart Championships in Newcastle over the weekend. with wild weather to start the weekend and nice weather to finish the four-driver team of Cadet 12 drivers Sachen Smith, Noah Lisle, Cooper Lisle, and KA4 Junior driver Josh Byrne were in for a challenging weekend. Weather conditions on Saturday morning forced a two-hour delay and qualifying to be canceled with timed practice order the grid for the opening heat races. Noah Lisle was the best of the cadet 12 drivers in the oversubscribed class in position thirty-seven. Smith was two spots behind him in thirty-ninth and Cooper Lisle the fifty fastest. Byrne just missed the top twenty in twenty-third position with work to do. The opening heats come around with all drivers looking to move forward from their starting positions. Noah Lisle was best of the cadet 12 drivers in heat 1 coming home in position eighteen in the split over subscribed heat with Smith nineteenth in his respective heat 1 and Cooper Lisle in twenty-second. Heat 2 and Noah Lisle and Sachen Smith both improved coming home in position twelve and fourteen with Cooper Lisle having a poor heat 2 finishing outside the top thirty. Joshua Byrne had a great opening first heat making up ten spots from his starting spot and finishing in position thirteen. Byrne’s second heat wasn’t as strong dropping to the back end of the top thirty but moving back slightly to finish the race in position twenty-five. Heat 3 and 4 come around and Sachen Smith had his best finish of the weekend in position eleven just outside the top ten with Noah Lisle in position fifteen. Cooper Lisle struck trouble having a DNF making the final looking out of reach. in heat 4 Noah Lisle finished in position fourteen ahead of Cooper Lisle in twenty-fifth. Sachen Smith had an unfortunate result in his final heat having a DNF. Byrne continued his progress through the field coming back into the top fifteen in position fifteen making progress through the field. Heat 4 was Byrnes best result of the weekend where he fought his way into the top ten coming home in position nine setting himself up for a strong final. In the cadet 12 final only Sachen Smith and Noah Lisle made the forty kart final with Cooper Lisle missing the final field. Sachen Smith drove his heart out in the final making up over ten spots just missing a top fifteen finish in the sixteenth spot with Noah Lisle just missing the top twenty in position twenty-two making huge gains on their heat starting positions. Byrne had a poor start in his final dropping outside the top twenty. In what was a great fightback drive Byrnes made his way back into the top fifteen by the finish coming home in position fourteen. Flat Out Karts Owner Greg Dicker was again happy with his driver’s continual development over the championship. “We currently aren’t in a position to win the championship but all of the guys are improving rapidly. Sachen drove a mega final, Josh fought back well after a bad start and both Noah and Cooper had highlights throughout the weekend we can build on towards Monarto”. Flat Out Karts will be back for the third round of the Australian Kart Championship in South Australia.